The Liebherr Tower Cranes Division planned and completed a job for a 1000 EC-H 50 Litronic in Schelklingen down to the very last detail. A new klinker production line is currently being built there whilst the cement works continues to operate normally. 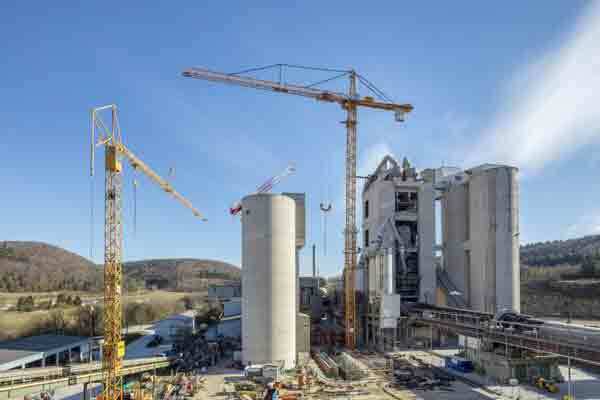 After Thyssenkrupp AG had been awarded the order by the customer HeidelbergCement, the planning phase conducted by the Liebherr Tower Crane Solutions Department working closely with Thyssenkrupp started in mid-2015. Together the team developed the most economical solution for the construction of the production line using a 1000 EC-H 50 Litronic tower crane. Since the new plant had to be built whilst the cement works continued to operate normally, there was very little space available for the crane. This meant that only a tower crane could be used since there was not enough space for any other type of crane system. The Liebherr 1000 EC-H 50 Litronic tower crane is able to hoist the highest planned load of 32 t with a radius of 31.5 m with ease. 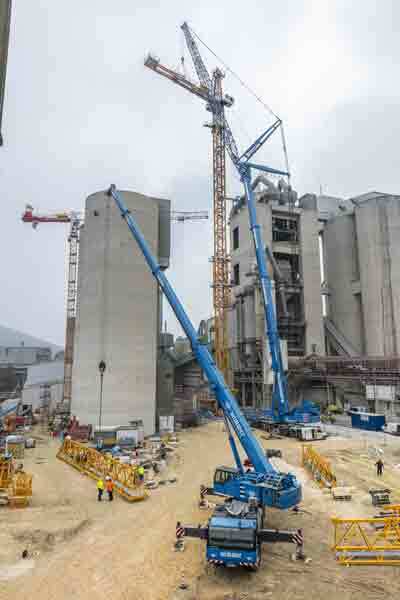 In mid-February, the tower crane was assembled by two Liebherr mobile cranes, an LTM 1500 and an LTM 1100 provided by Felbermayr subsidiary Wimmer Maschinentransporte. For the construction of the new klinker production line, the tower crane was assembled in free-standing form up to 77.9 m and at a later date, using three guying systems on the building it will achieve a final hook height of 163.4 m and operate with a radius of up to 50 m. It is due to continue working in Schelklingen until mid-2018.